Featuring original band members Mike Reno, Paul Dean, Matt Frenette, Doug Johnson along with Ken “Spider” Sinnaeve (who replaced the late Scott Smith), Loverboy recently reunited at Bryan Adams’ Vancouver studio The Warehouse, with their original engineer, legendary producer Bob Rock (Metallica, Aerosmith, The Cure, Bon Jovi) to record the two new songs which are included on the album, “Heartbreaker” and “No Tomorrow,” which were added to another specially-written new track, “Rock ‘n’ Roll Revival.” The re-recorded hit tracks capture 30+ years of the evolution of each song during Loverboy’s stellar live shows. 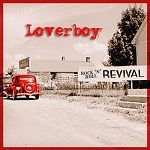 Click here for cover art and please see below for a complete track listing for ROCK ‘N’ ROLL REVIVAL. Please see below for confirmed tour dates, with more to be announced. For more than 30 years, LOVERBOY has been “Working for the Weekend” and on weekends, delighting audiences around the world since forming in Calgary, Alberta, Canada. With their trademark red leather pants, bandannas, big rock sound and high-energy live shows, Loverboy has sold more than 10 million albums, earning four multi-platinum plaques, including the four-million-selling GET LUCKY, and a trio of double-platinum releases in their self-titled 1980 debut, 1983’s KEEP IT UP and 1985’s LOVIN’ EVERY MINUTE OF IT. Their string of hits includes, in addition to the anthem “Working for the Weekend,” such arena rock staples as “Lovin’ Every Minute of It,” “This Could Be the Night,” “Hot Girls in Love,” “Heaven In Your Eyes,” “Turn Me Loose,” “When It’s Over,” “Heaven In Your Eyes” and “Queen of the Broken Hearts.” Loverboy is: Mike Reno (vocals), Paul Dean (guitars), Matt Frenette (drums), Doug Johnson (keyboards) and Ken “Spider” Sinnaeve (bass). ROCK ‘N’ ROLL REVIVAL tracklisting includes: Rock 'N' Roll Revival; No Tomorrow; Heartbreaker; Turn Me Loose; Working For The Weekend; Lovin' Every Minute of It; The Kid Is Hot Tonight; Lucky Ones; Always On My Mind; Queen Of The Broken Hearts; When It's Over; Hot Girls In Love.